WHITE COLOR COORDINATES WELL with a variety of colors and finishes. SIZE ADJUSTABLE From - 12.5 in. to 23 in. Measurements: Length 12.5 in. expandable till 23 in. Width 9.5 in. Height 5.5 in. Organize clothing and accessories, bath and beauty products, work and school supplies. Keep your kitchen counter, cabinet and pantry clutter free with our Expandable Kitchen Shelf. This expandable shelf makes a great addition to any kitchen. Helps you keep an orderly arrangement of assorted canned and bottled items in the kitchen or pantry. It adds extra space to crowded work areas, shelves, closets, or any place extra space is needed . Perfect for organizing kitchen, pantry's and cupboards, . Great for organizing plates, bowls, cups & other fine China. DURABLE STEEL CODING IS APPEALING. Provide more space on your counter or pantry shelf. 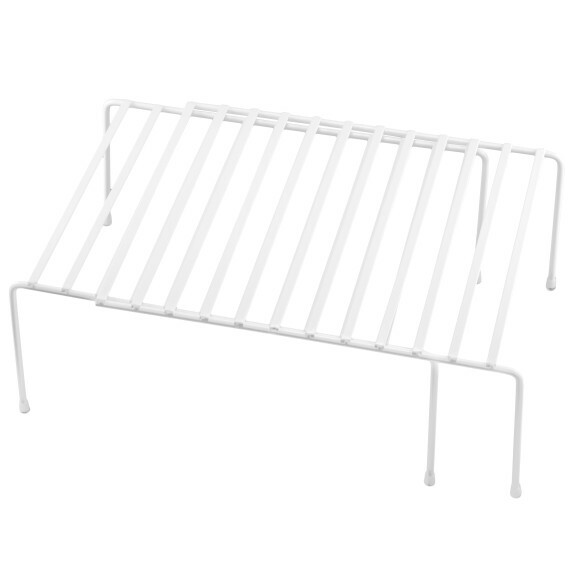 With this elegant white finish expandable shelf. This Ybm Home Helper Shelf is constructed of heavy duty steel and it has a perforated design which is a good decor to your cabinet and kitchen. Item is Steel coated formed into stylized shapes and designs which is more than just trendy; it's a timeless look of freshness to last you for years.